The strangest thing I find when I attend academic conferences is how some of the landmarks are, in fact, convention centres. That’s the case with the Palais des Congrès de Montrèal, in Montreal (Quebec). I attended a North American Commission for Environmental Cooperation meeting there this past summer, and I absolutely loved the location. It is close to major train stations, and across the street from the Intercontinental Montreal, which is the hotel where I stayed. 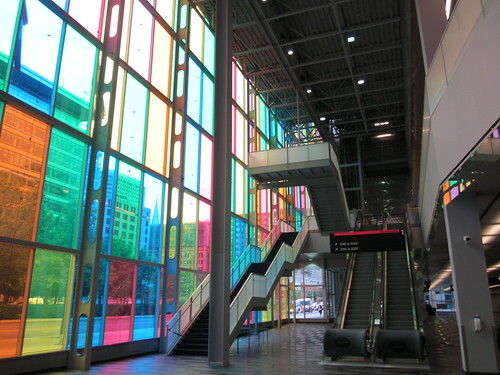 Since it opened in 1983, the Palais des congrès de Montréal (convention centre) has built a reputation for excellence spanning the globe. After 4 300 events and 12.6 million visitors, we can safely say that we have developed an unparalleled level of expertise in the industry. Located in Montréal’s downtown core, the Palais is a safe and bustling venue. 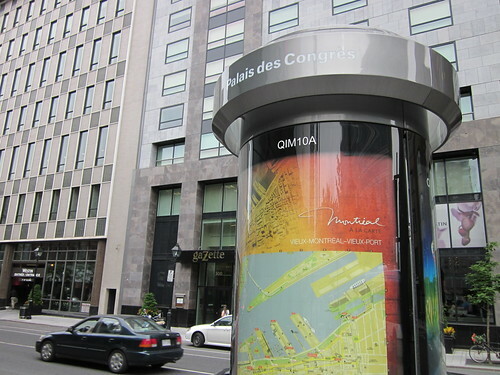 A hub of activity straddling the city’s business centre, international district, Old Montréal and Chinatown, it is near Montréal’s main attractions, and also less than five minutes from 12 000 hotel rooms, 4 000 of which are directly linked to the Palais via indoor passageways. lanning or attending an event in Montréal? 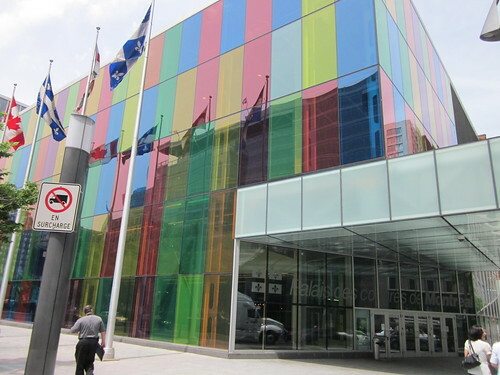 The Palais des congrès (convention centre) is an exceptional venue located in the heart of downtown and operated by an outstanding team of professionals. Its reputation for adaptability and superior services is unrivalled. Easily accessible by car, public transit, bicycle, and on foot, the Palais is also directly and famously linked to the city’s metro system and underground pedestrian network. The international airport is 20 minutes away, and the train station is virtually next door. Numerous hotels are nearby with a combined offering of 15 000 rooms in a range of categories. The Palais is a veritable hub where the city’s main attractions converge. It connects Montréal’s business centre, international district, arts and entertainment district, Chinatown and Old Montréal. For exhibitors, event planners and visitors alike, the Palais represents an unforgettable experience in a generously naturally lit environment that exquisitely combines form and functionality. Welcome to the Palais des congrès de Montréal! It’s a different style from, let’s say, the Vancouver Convention Centre, but overall, a very cute building. I’m not surprised it has such good reputation. I know for a fact that the American Association of Anthropology had their 2011 meeting there recently, and they loved the location, from what I see in the Twitter stream. 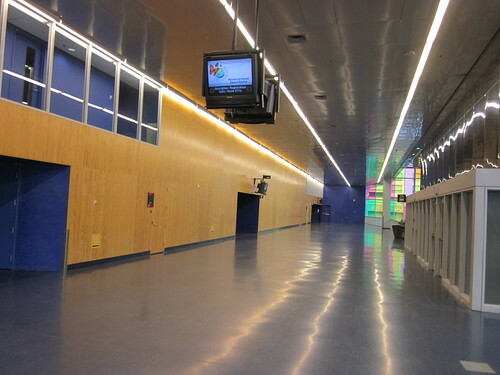 Next time I’m in Montreal, I will definitely come back to the Palais des Congrès de Montrèal. Even if just to try to take better pictures! I’ve been to one rave there (Bal en Blanc) and the car show two years in a row I think. The colorful stuff is more recent than the rest of the building–they spent years renovating it (and disturbing the heavy traffic in the area in the process). It’s a really weird part of town. You don’t really go there unless 1. you’re headed to Old Montreal or 2. you have to go to the Palais des Congrès. Now I’m even more homesick, if that is even possible!